Pilates Core Ball Workout: Sport Specific and Everyday Benefits! Choosing a Pilates core ball workout over traditional weight exercises that isolate muscle groups will do wonders for your particular sport and physique. Just check out some of my favorite core ball moves on my youtube video here. They have helped me with my golf game and mountain biking skills. The Pilates core ball workout is most beneficial for sports minded people who want to improve their balance and coordination and their games. Tennis – Increased strength and power in the legs allowing for quicker reaction time and more stable knees and ankles with the turning movements. One of my favorite moves to strengthen and stretch the ever tight and weak hamstrings is this hamstring curl in a bridge with the Pilates core ball. Begin lying on your back with your feet and lower leg resting on top of the ball. Exhale to lift the hips off the mat pressing your feet into the ball and then drag the ball towards your bottom as you keep your hips lifted and level. Inhale to the extend the legs pressing the core exercise ball away and then repeat for 8-10 repetitions. You will feel this exercise right away in your hamstrings and bottom. Golf – Increased core strength and power for better swing action and recoil flexibility in the spine. One of the best ways to use the Pilates Ball for improved rotation in the spine is the Spine Twist shown here on the exercise ball. Sitting tall on your ball with your feet hip width apart under you begin to turn at the waist with a pulse as you inhale. Exhale as you return to center. Keep your arms and chest wide as you turn from the waist, let the head and chest follow and keep your pilates ball still. Do this energetically and getting taller as you turn. Repeat for 4-8 repetitions each side. Hiking – Improved balance and agility, along with more strength in the knee and ankle joints for walking more steadily on uneven terrain. Bicycling – Increased body awareness and balance for quicker reaction to road or trail hazards. Improved core strength, posture, and flexibility reduces back and neck tension when riding for longer periods of time. One of the core exercise ball moves that works best for me to strengthen not only my deep abdominals, but also the neck muscles is the Double Leg Stretch shown here. Ball Sports – The Pilates core ball improves hand-eye coordination, as well as strength and power in the lower torso for jumping sports. The core and upper body strength helps to improve your turning, hitting, swinging, throwing, and even shooting sports. The best way to work the upper and lower body balance on the core ball is to work with your belly on top shown here as the opposite arm and leg extension. Center your pelvis on top of the ball with hands and feet touching the ground. Inhale as you extend one leg and then after finding your balance extend the opposite arm just out parallel to the ground. Exhale to return to center. Repeat on the other side for 6-8 repetitions each. 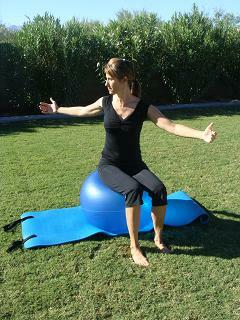 Check Out Our New Pilates Core Ball Workout DVD for a great Core Workout! This is a 34 minute dvd that will challenge your core while strengthening both your upper and lower body, improving your balance, posture, and helping to rev up your energy! Go here to buy the JUST released Pilates Core Ball Workout DVD!